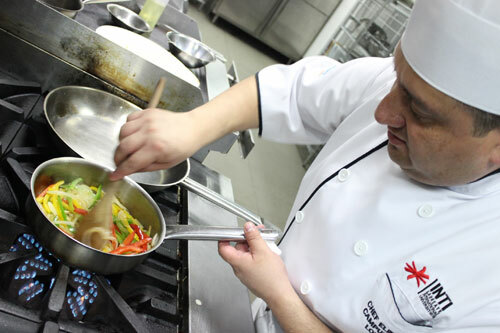 Chef Campuzano preparing one of the popular dishes from his homeland. In a five-hour session dubbed the Master Chef Workshop, Campuzano, a native of Mexico with more than 12 years of teaching experience in the culinary arts, exhibited remarkable culinary skills and efficiently guided over 30 students from the School of Hospitality in the fine art of preparing traditional Mexican dishes that included Ensalada de queso asado (roasted cheese salad) and Hongos al ajillo (mushrooms sautéed with garlic and dried chilli). Currently serving as Executive Chef at INTI International College Subang, Campuzano also provided advice on what it takes to become a successful chef, and how a qualification in hotel management can lead to a global career in the world of hospitality. “This is my first visit to Sabah and I must say I am delighted with the warmth and hospitality of the people here, particularly at INTI College Sabah. I am impressed by the way the College has provided much needed industry exposure to its students through initiatives such as culinary competitions and workshops,” said Campuzano who has trained with Swiss master chefs in Mexico and the United States. Part of its annual calendar of events, INTI’s Master Chef Workshop presents a unique opportunity for students in the work-based Diploma in Hotel Management programme to learn from accomplished chefs from around the world. It is one of the College’s commitments towards inculcating global skill sets among students. As Malaysia Centre for Tourism & Hospitality (MyCenTHE) cluster leader in Sabah, INTI is responsible for transforming Sabah’s hospitality and tourism education programmes to meet first class standards through an interactive curriculum that empowers students with the real life knowledge and training needed to increase productiveness and job marketability. Students will be trained to develop leadership qualities, confidence and resourcefulness, as well as learn how to analyse, strategise and make quick decisions. They will also gain valuable exposure outside the classroom with 5-star partner establishments that include Shangri-La’s Tanjung Aru Resort & Spa, Hyatt Regency Kinabalu and Le Meridien Kota Kinabalu.